I first attended American fandom conventions in the year 2006 when my friend attempted to utilize her own vehicle sans working breaks to travel to a city located within another state some one hundred fifty miles from home, a rural agricultural reservation. I volunteered to drive her there and experience what conventions had to offer. Studying cultural Anthropology at the time, no amount of relativism could allow me to understand a room-stuffing reality. My friend (who would later dress as a goomba) opted into an arrangement wherein she was one human in a room with eleven others plus myself. So, a cozy thirteen! My head was stepped upon and I was entirely unenthralled with what I perceived to be the careless nature of cosplayers. Little did I realize the rigors of Cosplay at that time! This first convention experience taught me to room-stuff responsibly! (MEANING NOT AT ALL!) Perhaps it was then I determined were I ever to Cosplay I would be iconic to the point of “no need for an explanation.” My mind was steeped in confusion… trying to recognize the identity of so many people in cosplay. All of these conceptions were new to me. I valued the subculture yet my face recognition senses were tingling. In the year 2010 I found myself in an undesirable marriage scenario and I began looking at the world around myself with eyes I had not formerly known. Within the pink satin sheets my aunt purchased, which I had never used due to texture and color… I saw a gown. 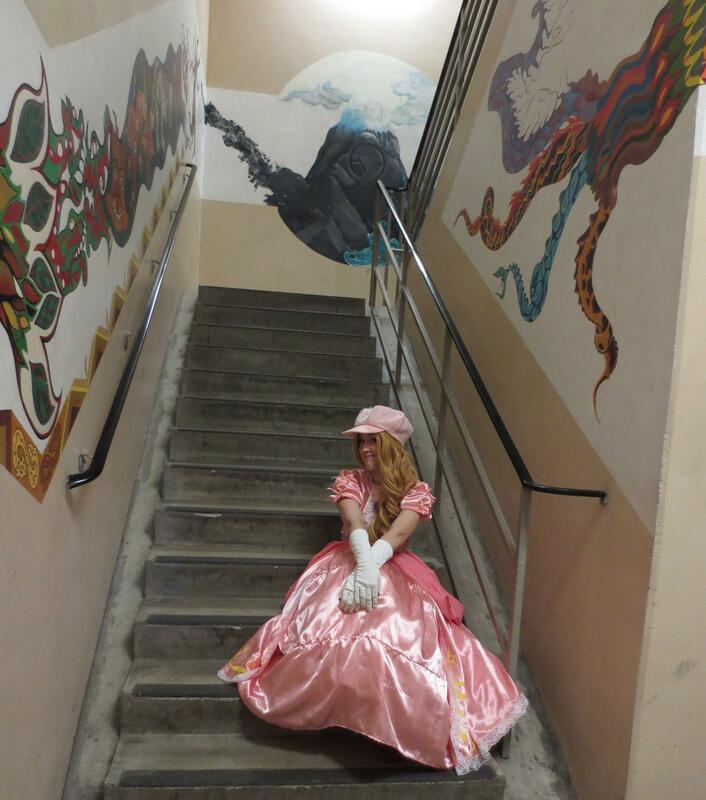 A Princess Peach gown. I imagined Maria creating a dress in which I could sing within. Yes, my instantaneous goal was not only to dress in iconic costume, but also to perform song in such a get up, and to know Julie Andrews as Maria. “Lalalalalala..” as peach would sing! I was all about participation, I had observed far too long! I soon discovered my idea to custom create a gown was most ideal as other Peach costumes for sale were either overtly sexualized or inaccurate in their rendering. I sought an intricate and fiery Brawler gown. Not because I personally ever play fighter games ever… I don’t literally… because my life was such (at that time) that specific Peach most accurately conveyed the type of Princess I could allow myself to be. Remember, when you Cosplay you are representing a character; you are no longer solely yourself. While you may bring your own life to the character there are times children may see you and you will delight them to bits, for this reason I have rules when I Cosplay. Stay positively in character regardless of the stupidity around you. Costumes attract commentary you don’t always want to hear. Exhibit behaviors you would like others to witness. In Cosplay it is kind of difficult to be discreet. Prepare for various weathers and wind gusts! Wear something under that dress? Prior to dawning any sort of geek regalia one must ask themselves a whole list of questions involving two words with the same letters arranged differently. Who and How? WHO of all the characters in all the verses would you like to dress as? HOW will that vision come to life? As a repressed reservation dwelling dork, I chose the Mario verse to initially express myself and I had access to my landlady a professional freelance seamstress! I provided the materials and she whipped up the dress I would wear in a timeframe as though magic were a real thing. While I have created clothing pieces on my own and with her assistance, I did not assist in the completion of this initial Peach Gown. 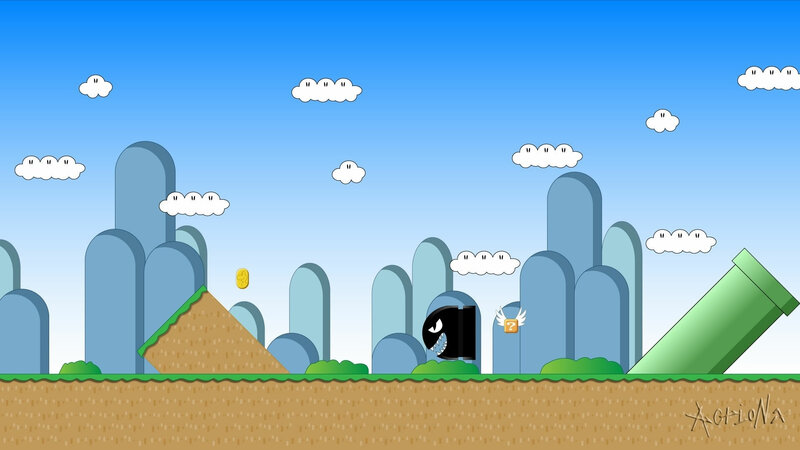 She would later make a pink Mario style plumber hat I would wear after my handmade crown was stepped upon. Finally, this magical maker of fine clothing also gave me a gift in the form of a full bodied skirt slip (used by her youngest sister at her wedding). This allowed for a princess type of flow for free! I was Cinderella… er… the von Trapp kids? 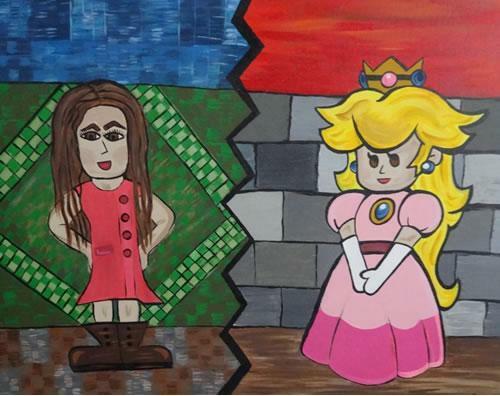 No… A fruit… I was PEACH! 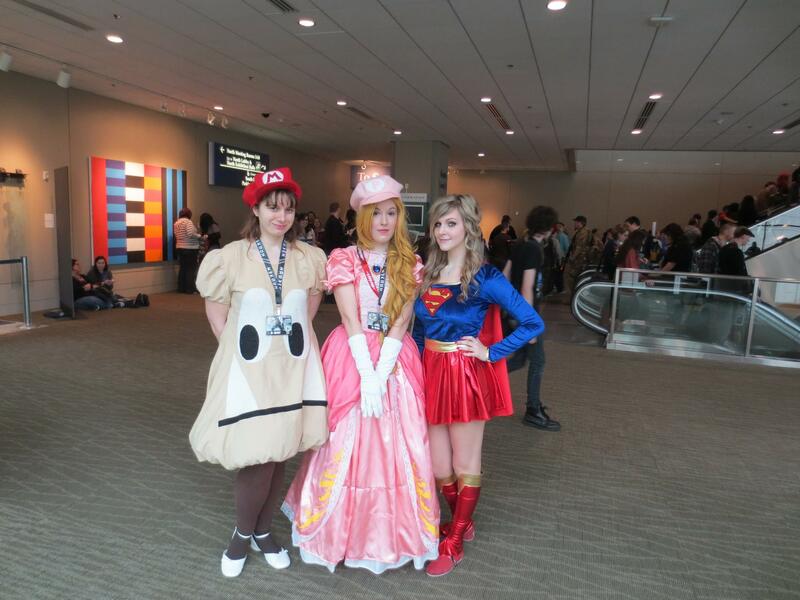 From left to right: Goomba friend, Princess Peach (author), Supergirl cosplayer. My initial crown was made from a plastic cereal bowl. Acrylic paint- white to prime and gold to finish and then craft store colored “jewels” which were hot glued on were used. Bobby pins were implemented to affix the crown and it worked well. I prefer the plumber style hat upgrade so that my wig line is well hidden. I learned at my very first convention within cosplay that people will verbally tear your costume apart if they can, they will find that Smaug armor crack and reveal it to all. Be prepared to defend any alterations you make to your costume be it a stylistic change or a change due to resource availability. Be meta about what you do when you cosplay. Or an Hakuna matata attitude. I first cosplayed during Kumoricon 2011, an anime and Japanese culture convention in Portland Oregon. 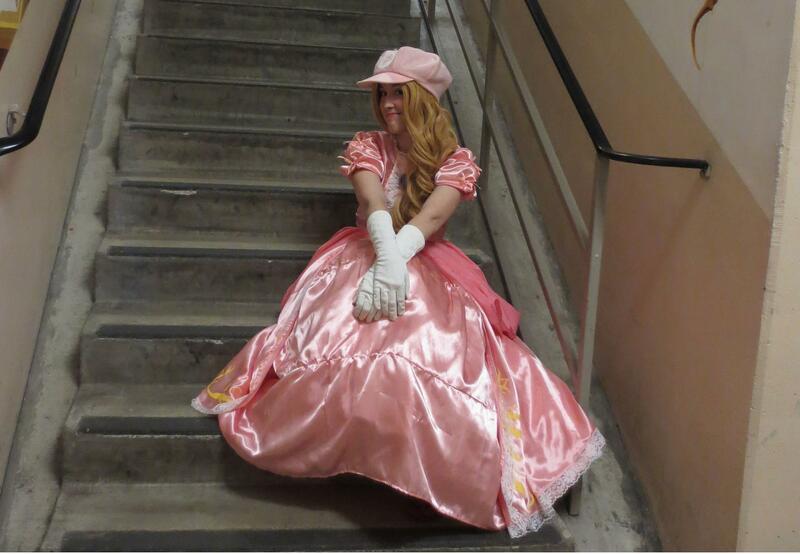 I became Princess Peach at this convention. My wig was purchased on the way and was five dollars as were my gloves. My shoes were five year old dark crimson Converse sneakers with the heels so worn they were falling apart and digging into my feet all at once. In transit upon the streets I let those negative thought impact my confidence. 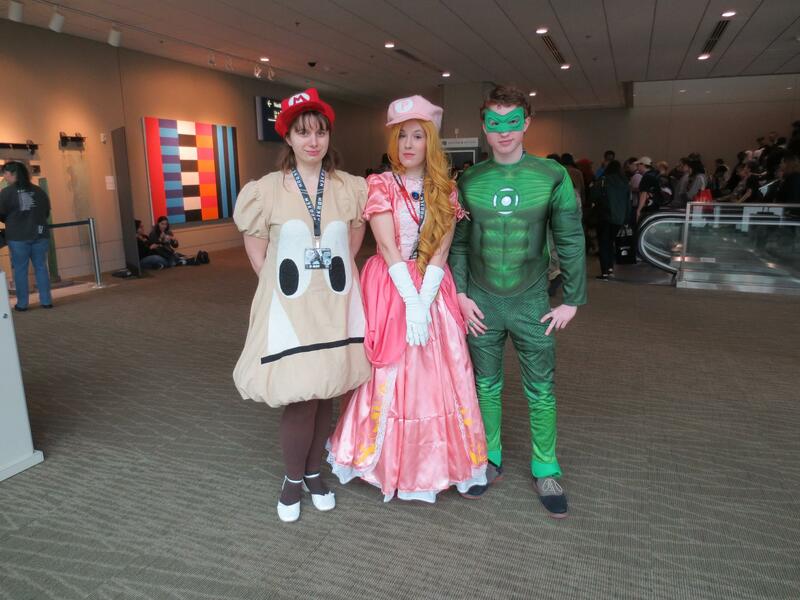 I didn’t let those thoughts creep into my head once I was floating around as Peach in convention space. While dressed in cosplay people were complimentary in a way they had not been prior to my submersion. 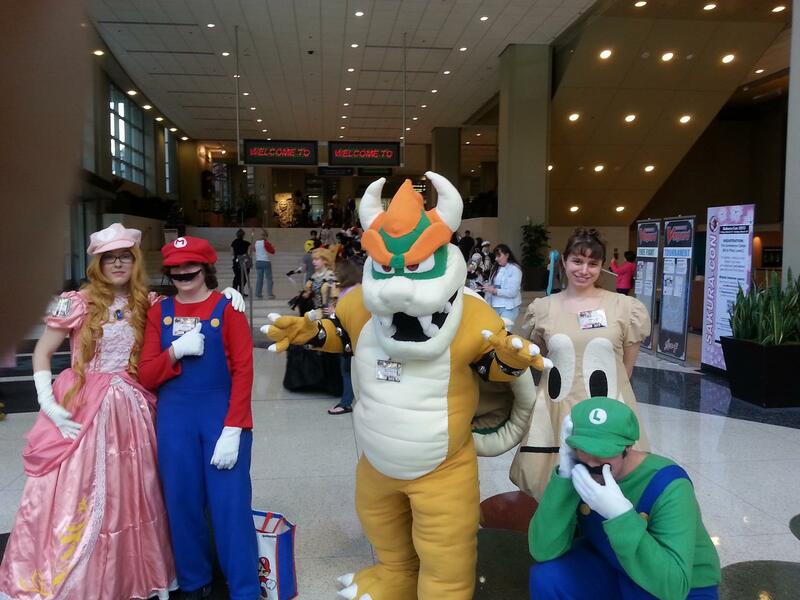 When I appeared normal no one approached me during a convention… at all. Not only were there countless photograph requests, there was a communal spirit I was able to feel which could not be shaken. 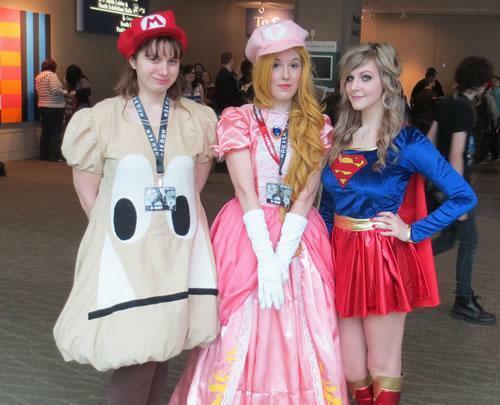 I was hooked on cosplay and Princess Peach was the conduit. Now for that song? I was going to sing… and I was too late. The rehearsal times were altered and I did not get my chance! This first cosplay experience taught me to prepare adequately! If performance within your cosplay is something you want to happen you have to plan. While I was not able to rehearse, I sang Karaoke for the first time during this convention and I had a fun time doing so. Once home, I felt as though I failed. Or I hit my head on a block with no gold and… I really needed some? Just my luck… another convention and a chance to not only participate… but win?! In three years time I went from a chronically anxious person (who as a teenager ran off stage during vocal performance time in tears… yes, that actually occurred….) To a winner! I have received awards at six differing conventions during Cosplay/Masquerade Contests and I have been a Peach in song during each of those performances. 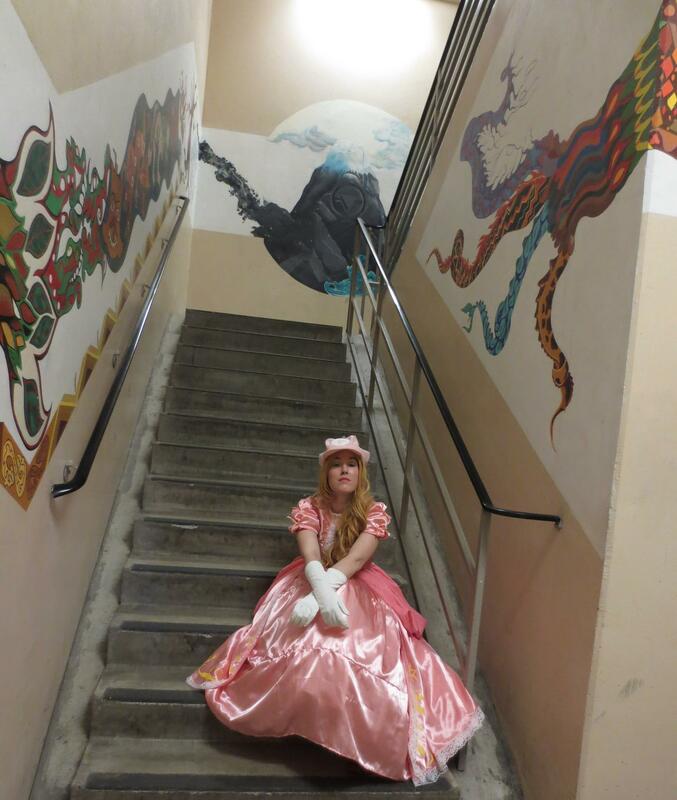 Being Peach taught me to embrace fun more so than I would have been able to do on my own in my own clothing. Cosplay is about participation and having fun. Expressing your love for a character or a world within the costume of a character. I suggest starting as you can and making upgrades along the way. If you don’t have all the pieces to make a perfect look realize the concept of perfection is rubbish and embrace what you have until you can afford to replace the item. Just think, what would your character do? Who exactly is your character? At a 2012 summer convention Kuro Neko con, prior to a singing performance, my zipper broke! There was no way of doing anything but either sitting it out… or embracing it. (When I decide to participate non-participation is no longer an option.) I quickly created a sign, I modified my skit… took off my shoes and pretended to be a cosplaying begging Peach who “Would Sing for Turnips.” My Goomba friend pelted me with plushy turnips we had created and the rest is a story of first place win… what did I win? A plush Mario Block! My Cosplay experiences thus far have taught me that dreams can come true. Why? Because now I am writing of such experiences! A cause I can get behind is writing about such play! Why? 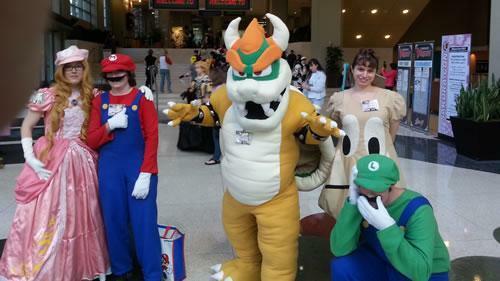 Because Mario verse cosplay changed my life!